Flower Mound resident Debbie Sardone has been cleaning up for 35 years. She started her maid service out of the trunk of her car to make some extra money — the only ‘maid’ in her employ. But just eight years later, she had a book of business and wanted more, so she hired employees, moved herself into the owner/manager role and built Buckets & Bows Maid Service. Today, with an operations manager and staff running the day-to-day operations at her company, Debbie spends much of her time teaching and coaching other maid services around the world how to grow to be a million dollar business. Debbie is a learner: self-taught, always reading and never without a coach to keep growing her own skills. To wit, when she was cleaning houses herself, she found an ad in the back of the newspaper for the book Speed Cleaning by house cleaning expert Jeff Campbell. Jeff’s techniques promised consistency and efficiency and a complete house cleaning in 42 minutes. Debbie bought the book, taught herself the techniques and put them to use in her business. She eventually met Campbell at a conference, enthusiastically introduced herself as a fan and, years later, collaborated with Campbell on a book for the professional cleaner using Jeff’s original trade techniques. She’s built on that original 70-page book for the pros with a membership-based training and coaching program, live workshops, instructional DVDs, and business forms and documents, all focused on giving other maid services what they need to replicate her cleaning business success. Today, hundreds of maid services in the US and Canada and as far afield as UAE, New Zealand, the UK and Ireland come to Debbie and Buckets & Bows Maid Service for how to grow their own business. They watch Debbie on YouTube, follow her on Facebook, join her Cleaning Business Fundamentals program, implement her pro Speed Cleaning™ training program and make field trips to the Buckets & Bows office in Lewisville to see how it runs. The employee training program that Debbie implemented at Buckets & Bows is now being recognized by the cleaning industry. Previously offered as a two-day live conference to which cleaning business owners had to travel, at their expense and losing time at their own businesses, Debbie and her team are bringing employee training right to the owner’s door, wherever in the world that might be. DVDs, books, workbooks, exercises, forms and even graduation certificates neatly organized in a media literature kit, the Speed Cleaning™ for the Pros Employee Training System is the first complete training system for the residential cleaning industry. And it has been nominated for the 2018 ISSA Innovation Award, running against powerhouses and household names in cleaning. It’s a comprehensive set of tools to help create an in-house training program for onboarding new employees and refreshing the skills of veteran staff. 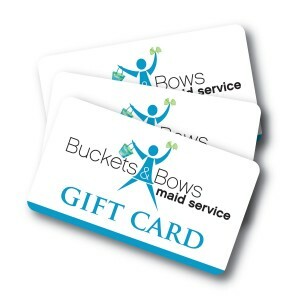 The system is designed to improve quality, consistency and efficiency while reducing payroll costs and employee turnover; it’s a win-win-win for business owners, employees and the customers they clean for, just as it has been at Buckets & Bows Maid Service for so many years. Voting for the ISSA Innovation Award takes place now through October 15th. You can see all nominees and vote for the Speed Cleaning™ for the Pros Employee Training System HERE. You’ll need to create an account but it’s free and ensures voting integrity. Not only terrific & thorough service but delightful personnel as well! So glad I chose this company. Very impressed with their service. A special shout out to Stephanie. I have just received my first visit from Buckets & Bows and they did an amazing job. Staff is top notch .